The most cost-effective option to distribute the software within your department/campus. All users will benefit by using the latest supported version of OriginPro. Access the software from university-owned machines, as well as faculty-owned and student-owned personal computers. Priority product and licensing support. Free product webinars to help users optimize their use of the software, and to learn key features in latest version. Regardless of the size of your department or campus, we will work with you in providing the best licensing and pricing option for your specific needs. 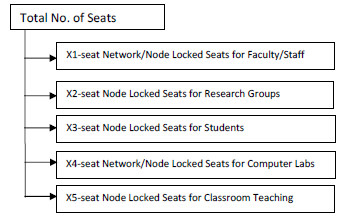 The total number of seats can be divided into multiple distinct groups if desired. Each group can be a concurrent network (floating license) or a set of node locked computer-specific) licenses. User-friendly online tools for administration and distribution of your licenses. Deactivate and Activate license on another computer (for node locked licenses) directly from Origin.